The DHP Jenny Lind Metal Panel Bed exudes charming country flair perfect for any child's bedroom. The metal frame features a classic spindle design in the headboard and footboard. Choose from available finishes to best coordinate with your space. 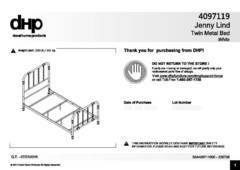 This twin-size bed fits a standard twin mattress (not included) and requires a mattress foundation. Thanks to Walmart's savings casher, I was able to save me even more on this adorable bed for my daughter! It was shipped to our home and had no issues with shipping, love how it let me keep track of it to insure when it was delivered. All parts were there and no issues building it, super easy. We've had it up for a month now and in my opinion is strong and sturdy, no issues there. The look of it in person is amazing, the color and detail is very beautiful and have had several compliments on her bed. I was concerned about the size, I didn't want a bed too bulky because her room is small, but the size of this bed is perfect! Our daughter loves her new bed and now cannot get her out of bed! LOL we absolutely love everything about this bed!! Very cute bed! Although I wanted the more traditional Jenny Lind look, this bed was much cheaper than comparable beds on other websites. It looks adorable in my daughter's room. The only thing I would change about this bed is the finish. Matte would have been preferable to glossy. We ordered two of these beds for our daughters and they love them! They were easy to put together and they are very well made. I would highly recommend this beautiful bed! Easy assembly and beautiful bed. My 4-year old loves her new big girl bed. Cute and not cheap-looking at all. Was concerned when buying a bed from Walmart that it would not look very nice, but it did! Easy to put together and very sturdy. The only surprise I had was that the box spring did not fit super snug, there was some extra room around it, but not a huge deal because you can't see that once a bed skirt is on. My daughter loves it, and we were very happy that it was a great price but looks MUCH more expensive. Cute bed for my toddler. Very lightweight but I didn't mind that. Also went together very easily. However, it did come to me with a chunk of paint missing on the head part so I assume it will be easily chipped. Nice beds. Hayneedle shipping was unreliable. We ordered two of these beds for our children who share a bedroom. The beds themselves were packaged very well and arrived with very minor blemishes (that we can totally live with). I (mom) was able to put both beds together by myself, with no help. The instructions were very clear. And bonus : ALL THE PIECES WERE INCLUDED FOR BOTH BEDS! We were very very happy with that. The beds are pretty sturdy and very cute. Great value for the money. CONS : the screws were VERY tight to get into several places...the included "tools" will hurt your hands after "fighting" with tight screws. Another major con was getting them. When I checked out, I was informed that I could get the beds in a week (including a weekend and a major holiday) with free shipping, or in two days if I upgraded shipping. I opted to upgrade shipping since we were moving and would be staying in a hotel for a few days. I definitely wanted them before we moved. They did not even ship until the day I was supposed to receive them. And then they shipped from clear across the U.S. estimated delivery was then two days AFTER I would have received them with free shipping. They became a huge hassle to get. We did finally get them, and hayneedle customer support refunded the upgraded shipping cost...but I was left wondering if they even cared that the order ended up being such a hassle. Love the old timely look! Ordered this bed for my daughter's birthday. Came in a perfect condition box. Opened it, spindles were bent. Someone had to have known this was damaged prior to boxing. We returned and reordered, as it is super cute. Crossing my fingers the next bed will be okay. Can you tell me the measurements of the package for the full and for the twin size please? 1. Hello, the shipping dimensions of the twin size version of this product are as follows: Length: 47" Width: 37" Height: 7" Weight: 56 lbs. The shipping dimensions of the full size version of this product are as follows: Length: 62" Width: 37" Height: 6" Weight: 65.5 lbs. Thank you.